How does one handle weekly magazines that contain a hodgepodge of information? I have been reading such magazines since at least 2009 and there are a multitude of recipes and craft ideas in each issue that I would love to digitize so that I can reduce the actual paper and still have access to the information. Is there any current information on this subject? Woman’s World now seems to exist in somewhat of a digital format for e-readers and digital magazine services such as Zinio. However, this will only address issues from 2017 going forward, not past issues unless I pay to access issues I already own. Do you have any advice on scanners or easier ways to convert my paper magazine articles to digital format? This is a good question Ms. Ball and I’m sure you are not the only reader who wants to digitize this type of information. Before you start the digitizing process, the best thing to do is organize the clippings you have accumulated. If you haven’t already, take some time to sort them into file folders, envelopes, or zipper seal bags. You could clip them together with paperclips or clothes pins — whatever you already have around the house. Just do enough to keep the same types of articles together long enough to get them digitized. While you are sorting, take the time to toss out any articles that are no longer of interest to you. If the articles are still in the magazines, you don’t need to spend time cutting them out because you can scan directly from the magazine. Perhaps put a sticky-note on the front cover to remind you what it was that you wanted to digitize (Page 9 – wedding dress pattern, Page 33 – cheese cake recipe). Next, think about where you are going to store all of this digital information. You could create a virtual filing cabinet on your hard drive or cloud drive (Dropbox, iCloud, etc.) or create a series of virtual notebooks on a cloud service such as Evernote. Now that you have your paper clippings organized and your digital storage space prepared, it is time to start scanning! I suggest the low-cost, all-purpose, Canon CanoScan LiDE220 Photo and Document Scanner. 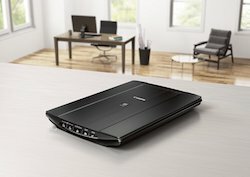 Because it is a flat-bed scanner, the disadvantage is that it won’t allow you to load up a pile of documents and scan them rapidly. However, it has a unique “expansion top” that allows for easy scanning of thick books and magazines. It has an “auto-scan” mode that detects what you are scanning and automatically adjusts the settings. If you scan articles in PDF, it will also automatically do optical character recognition (OCR) creating searchable documents. Thanks for your great question Ms. Ball. We hope that this post gives you the information you’re looking for. All the best in digitizing your magazine articles. Many magazines now provide you with the ability to save articles, recipes etc to Pinterest. I used to have piles of magazines, but now I do everything on line and save to Pinterest. The site allows you to set up different folders for different topics. I suppose it may not help with articles as far back as 2009, but it’s a suggestion. Give up the magazine subscriptions. You will soon discover that you don’t really miss any of the magazines. I had the same problem. I cut up many of my cheaper magazines and scanned the clippings using a Fujitsu ScanSnap S1100i. I ordered it off of Amazon. I LOVE this scanner and use it for so much. It is very compact, and you can feed page after page through it quickly, unlike a flatbed scanner. But I also had some really beautiful, collectible types of magazines (the $15-$20 per issue kind) that I didn’t want to cut up because I thought I might try to sell them or pass them along to someone. They were just too pretty to destroy. Fortunately, I found the CamScanner app for my Android phone. It’s amazing. You just snap a photo of the document or article, and it automatically straightens it and brightens it (if you want it to). The scans are available both in the app on your phone and on the CamScanner website. You can keep them there or send to just about any other app. I send the files from my phone to my Dropbox account. If I had known how great and easy this app would be, I might not have even bought the ScanSnap. CamScanner is free for up to 200 MB of cloud space, or it’s $5 a month for 10G of cloud space. I don’t know if it’s available for iPhones. If not, there’s probably a comparable app. Thanks to these two solutions, my two tall bookshelves full of magazines are GONE. What a lot of work for articles that you may NEVER look at again!!! I urge anyone considering this method to first take a look at what articles they have saved and when they last needed to refer to them. I used to save articles, had them organized into topic folders, saved them for years, and NEVER ONCE looked at them. I thought it was all great information, but I never remembered what I had. I can’t tell you how liberating it was to stop doing it, and finally let go of all the tips and tricks and “best ways to” articles that I had saved. It’s okay to not always know how to do something. You can learn as you go. And, you can always Google it if you need the information. The truly useful information will be on the Internet. As for the articles, keep only what you will use on a weekly or monthly basis. Otherwise, recycle the paper and truly unclutter a part of your life that might be weighing you down more than you realize. Good luck! I find it easier to snap a pic with iPhone or iPad and then create an album for like items such as recipes. Easy to delete when done reading or if I don’t like the recipe. And I’m not creating another project of scanning all afternoon. I’d skip the entire sorting and organizing part — that sounds like a lot of work for magazine clippings. I have a “misc” folder in Evernote (in addition to my work and personal folders) and dump all such scans and clippings from the web and photos of short pieces of information there. If I need something, I simply do a keyword search.